Rashid Khan was literally everywhere. With the ball, he wasn't afraid to toss it up. Whenever he got a wicket, he was right there in the thick of things, his hair ruffled by all his team-mates in a manner that suggested they were fond of their youngest member. On the field, he was a bundle of energy. While his build may not suggest his sprinting abilities, the reality is far from different. On one particular occasion, he chased the ball from cover, dished in a dive and was airborne as he pushed the ball back inside the field of play. The recovery was equally good as he got up and fired a quick throw. Astonishingly, he was in his fielding position even before the bowler had walked back to his run-up. Talk about the exuberance of youth. Asghar Stanikzai's presence as a leader can't be understated, but the same can't be said about his fielding abilities. Which is why it was particularly surprising when he jumped high at midwicket, stretched his right hand out and plucked out a fierce Chamu Chibhabha pull at the edge of the circle at midwicket. Stanikzai's celebration suggested he had exceeded his own expectation. But that glee on his face quickly disappeared shortly after as he dropped a low chance off Hamilton Masakadza at mid-off. On another night, it may have proved to be expensive, but Masakadza's dismissal soon after meant Afghanistan didn't really pay for that dropped chance. What made this particular stroke a delight was not in its execution, but because it came out of nowhere. The manner in which Luke Jongwe changed his bat grip to get the elevation and pull the ball in front of square almost seemed too good to be true. The bowler's reaction was as if to suggest Jongwe had no business playing such strokes. That Jongwe managed to bisect the gap between the two boundary riders, no more than 20 metres apart, made the shot that much more special. For all his talent, one of the major complaints about Chamu Chibhabha has been his inability to channelise his potential into match-winning performances more frequently. 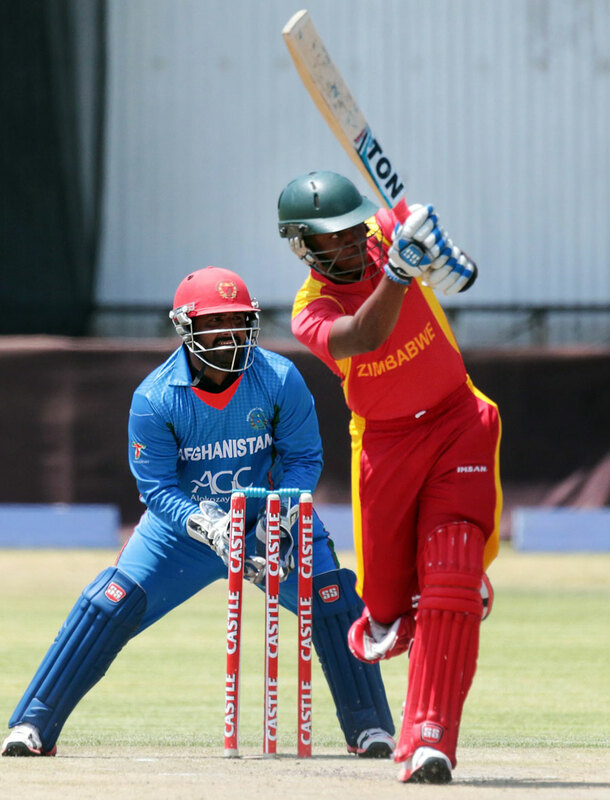 However, he was on song on Monday, as he top-scored with a half-century and then nipped out the important wicket of the big-hitting Mohammad Shahzad to smoothen the passage of victory for Zimbabwe. The hallmark of his knock was not as much about his score, but about how quickly he realised the need to play second fiddle to the big-hitting Peter Moor during the course of their 92-run opening stand.